As Julia Thomas points out in Pictorial Victorians, the satirical cartoons and anecdotes in Punch heavily colored contemporary (and modern) impressions of the fashions of the 1850s and 1860s. As a result, the wide skirts seem like fantastical costumes that played havoc with ordinary life and were impossible to move around in. And so the myths have proliferated. “Cool Request,” Punch, or the London Charivari, Volume 32, January 31, 1857, p. 50. The first myth to address is the name of the garment. My impression is that most people use the term "cage crinoline"- "hoop skirt" sounds farby: it gives the impression of a cheap and flimsy petticoat worn by someone who doesn't know any better. eBay and Etsy sellers using elastic and plastic sell hoop skirts, but those who use metal and fitted waistbands (and the more established companies with their own websites) sell cage crinolines. Even when used without a negative implication, "hoop skirt" tends to be reserved for fabric skirts with channels for bones. This distinction, however, is not historical, though it's handy for a modern context. 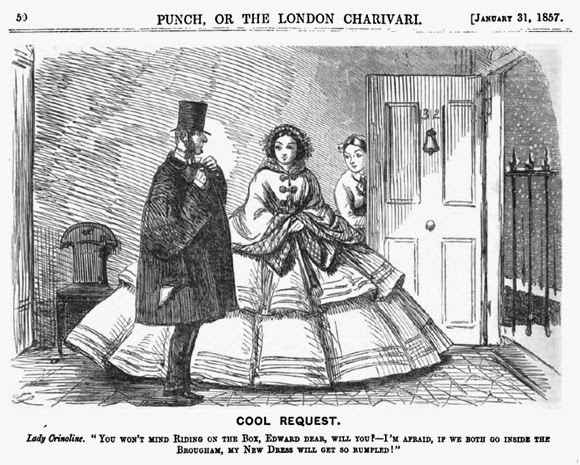 I can find one reference to the "cage crinoline" in a Peterson's Magazine of 1863, but every American patent for one calls it a "hoop skirt", as did most merchants. 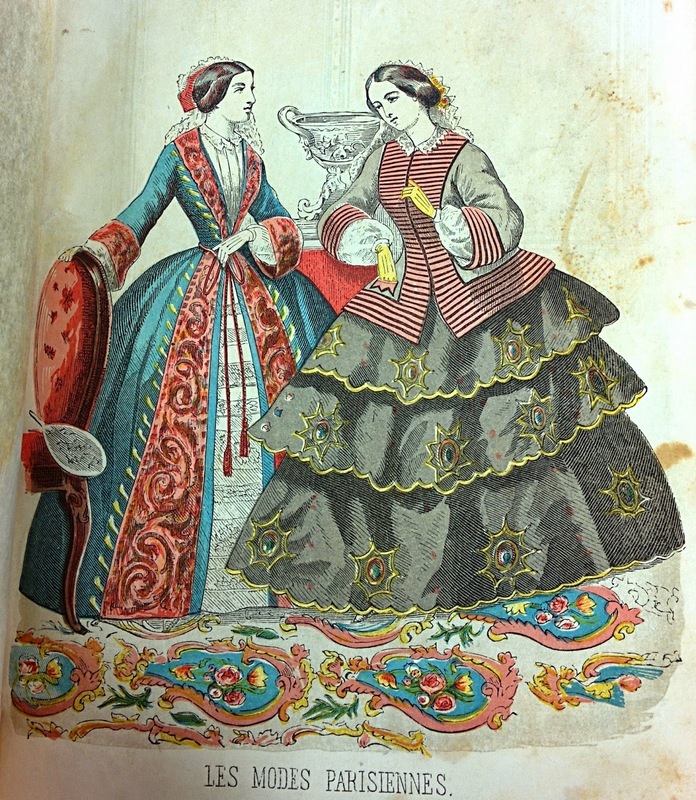 "Crinoline", used without an article (eg. "but wife and daughters alike received the sarcasm carelessly, and the wrath meekly, and continued wearing crinoline as before." - from "Who Killed Crinoline? ", reprinted many times, found here in Once a Week, 1869), appears frequently, but it refers to the whole genre of skirt supports rather than a specific type. When used in a specific way, such as in an advertisement, it still lacks the "cage"; in this description, "crinoline" is used for what we now call a hoop skirt. The feminine world had skipped swiftly from the clinging fashion of high directoire waists into the hoops of an exaggerated crinoline (invented by Worth for the Empress Eugénie, in order to conceal her pregnancy). - Phantom Crown: the Story of Maximilian and Carlota of Mexico. Bertita Harding, 1934, reprinted in 2008. pp 31-32. The myth that Empress Eugénie had the hoop invented to hide her pregnancy is frequently connected with Worth, most likely because Worth is known to have worked for her and also to have autocratically caused fashionable changes. But Worth was not working for Eugénie at the time of her pregnancy (1855-1856), and did not even have his own firm until 1858. And on the other side, the hoop didn't need to be invented as it was actually just an innovation on petticoats stiffened with cords threaded through sewn channels. However, the story has existed as long as the hoop skirt itself. "Those newspapers, - but, then, newspapers are never accurate - have insinuated that the Empress Eugenie brought in crinoline for a most womanly reason", reported The Spectator (in 1860) while denying the validity of the rumor. "One is the Empress Eugenie, who at a certain period, for personal reasons, introduced an excess of crinoline which gradually led to cane hoops and steel petticoats", Charles H. Bennett wrote in Shadow and Substance in the same year. The timing certainly is helpful: the hoop was patented in 1856, and Eugénie was pregnant during late 1855 and early 1856. The fact that even contemporary sources scoff at the rumor is a decent enough reason to set it aside, but let's consider it for a moment. It might be physically possible for a woman to hide a pregnancy at an early stage, or a low-carrying pregnancy, with a hoop and a raised waistline, but the same feat could be accomplished with a voluminous crinoline petticoat. And fashion at the end of the 1850s called for a lower waistline: the waistband of the hoop or crinoline would probably hit right on the tell-tale bulge. The result was that serious injury or death became a kind of occupational hazard for crinoline wearers. The most common danger came from fire. Information about more named crinoline fire deaths here, use of satirical photo seriously notwithstanding. Like others, I found it unlikely that factory workers would dress in something as obviously impractical as a hoop. Surely that would be immediately apparent to them - and besides, wouldn't such a fashionable accessory be out of their price range? Searching period sources reveals a Miss Marshall dying in 1860 from her crinoline - from context, most likely the proper horsehair crinoline rather than a cage - being caught in a machine. But for the most part, references (such as this one in the Eclectic Magazine, 1862) are vague and don't specify names, and so are suspect as urban legends or deliberate propaganda. There are, however, many references to servants dressing in hoops. That Cassell's Household Guide (1869) specifically recommends that employers prohibit their maids from wearing crinoline is a strong indicator that those maids would otherwise wear them. A column called "Centre-Table Gossip" in the Ladies Magazine in 1860 (summarized and excerpted in Domesticity With a Difference) also stresses the unsuitability of hooped skirts for household tasks, along with some suspicion that maids in crinoline are either failing to save their money for necessary expenses or are stealing or prostituting themselves to afford them. In texts from all historical periods, you come across complaints about servants looking too much like their employers (maids wearing silk in the early 18th century, printed cotton some decades on, and white muslin during the Regency were all issues) - clothes are always used to signal something to viewers, and an affluent woman's are meant to show her status. If one of her servants can mimic them well , then what's she left with for her own signals? By the 1870s, it seems to have been accepted that maidservants would wear hoops, but the concerns over the hoops being impractical still existed. I would tend to agree that the "died from crinoline" stories hype has a kernel of truth in that a scant few people met an unfortunate end due to fire or getting caught or even tripping and falling, and the shock value contributed to the stories being repeated, changed, "telephoned," and the end result of appearing much more common than it actually was. If anything, a couple documented "horror stories'" existence is proof that it didn't happen often--if people died of crinolines as often as they died of, say, pneumonia, no one would bother writing down stories about it! Yes, exactly. And people knowing about the few times it did really happen probably made it seem more plausible when a newspaper or periodical vaguely referred to it happening to unnamed young women in various settings. Oscar Wilde's father had two daughters with another woman who both died when one of the girl's hoop skirt caught fire and the other tried to help her.